Did you know that it’s impossible to create a real legato on the piano? And yet, great pianists can make the piano SING and their legato seems so smooth and expressive! There is a special technique that allows us to create the illusion of an incredible, singing legato, this way making the piano sound like the human voice or the violin. And now I’ll post the entire tutorial in written form! The piano is a magical instrument. It will respond to you exactly the way you treat it! Its sound will be harsh and percussive if you hit the keys brutally – but it can also be soft, vibrant and singing if you learn a few efficient secrets! Yes, the hammer-and-string construction of the piano does not allow us to make an objective, real legato. That’s why the Intoning Technique was invented: it helps us to create the audible and visual illusion of legato and a flowing phrasing! I’m going to share with you 7 easy yet very powerful tips that will change the quality of your piano playing for good, making it smooth, expressive and singing. Tip No. 1. Play with your arms, not only with your fingers! As I mention in almost all my tutorials, the foundation of a correct piano playing habit is the whole arm action principle – playing from the entire relaxed weight of our arms – and not by taking the needed force only from our fingers. Besides protecting us from tension and pain, this technique enables us to create a deep, beautiful piano tone – as compared to the shallow, percussive sound that comes out of the instrument when we strike the keys only from the fingers. Plus, let’s not forget that the piano keys are rather heavy – and this is the main reason why we have to be smart and use the relaxed weight of the entire arm for depressing a key, without making effort – instead of overworking our poor fingers alone, this way causing hand injuries. Tip No. 2: Make sure that your key attack is gradual and relaxed. When we press a piano key in a gradual manner, we are actually softening the hammer action, making the contact between the hammer and the string lose its harshness. This technique, along with playing from our entire arms, takes us one step closer to a beautiful legato, being another pillar of the intoning technique. Tip No. 3: Keep your wrist flexible. Keep your wrist loose and relaxed. A flexible wrist has double benefits: it protects us from wrist injuries, which happen when we play in a tensed manner, with immobile joins – and it also softens the key attack some more, making the sound more vibrant and noble. And don’t forget about your shoulders and elbows! Keep your shoulders down and avoid ‘gluing’ your elbows to your sides. Make sure they have a wider position – this will allow you to ‘fly’ and feel absolutely free when playing. Tip No. 4. The ‘walking arm’ technique: transfer the arm weight from one finger into another. The technique which is usually called the walking arm is another efficient secret of the Russian piano school, being yet another brick in building the illusion of legato. It helps us to connect several notes on a single movement, transferring the weight of our arm smoothly from one finger to the next one. This sensation is similar to walking and transferring the weight of your body from one leg to another – that’s why it’s called ‘the walking arm’. It instantly smoothes out the transitions between notes and minimizes the gaps – reinforcing the illusion of legato. When you play in this manner, you must have the feeling that you push yourself from the keys with each finger, instead of simply lowering each finger towards the keyboard. There is lots of relaxed pressure involved in this technique and it creates a deep, professional piano sound. And now – the cherry on the cake: the last technical element of the intoning technique – the one behind its name. Tip No. 5: Horizontal wrist navigation – the core of the intoning technique. This technique works like magic – especially in melodies that have large intervals. We call it ‘intoning’ because it is similar to the technique used by singers to make the transfers between two notes as smooth as possible, as if the second note is the natural continuation of the first one. This technique is also called wrist anticipation, because we anticipate the ‘layout’ of the melody with our flexible wrist. If the melody goes up, the wrist goes up first, taking the fingers to the needed position in a flowing, relaxed gesture, which instantly makes the second hammer lose the harshness of its attack. Tip No. 6: Learn how to manipulate the sound intensity. What happens if we play two notes on the same intensity level? Because the first one has already faded, we get the illusion that the second one sounds louder, because its intensity level creates a contrast with the previous fading note. I agree – this is very annoying – but we can make good use of this particularity of the piano mechanism if we’re smart ;). Listen for the decay of the first note and match the next note to the same volume level. This way both notes will sound equal – and your hearing will perceive a smooth, perfect legato! Tip No. 7: Hear, imagine, anticipate! Even if you follow all the tips I just shared, to the letter, you still won’t be able to master the intoning technique unless you activate your inner hearing and your imagination. 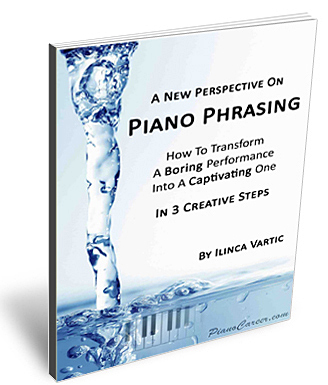 Instead of pressing the keys one at a time and waiting for what will come out of the instrument – you have to imagine the phrase first (just like I describe in my report A New Perspective on Piano Phrasing). Your mind should always be ahead of your fingers, anticipating their movement. Mental anticipation, imagining the entire phrase before actually playing it – this is the most important element of the intoning technique, the one that guides all the other elements, making them work together for creating the illusion of legato. Just like any other type of piano technique, intonation cannot be mastered overnight. It requires some practice and patience – but its fascinating effects are totally worth the time and effort! When you practice a piece, focus on the beauty of the sound as well – not only on technical difficulties. Listen carefully to the quality of your legato, to the continuity of your phrasing – and also monitor your gestures. Polish both, one little fragment at a time, sometimes even one transition at a time – until your mind and your muscle memory learn how to create this new effect. As days go by and you become more experienced, the intoning technique will become an inseparable part of your pianistic skills, being as natural as breathing and requiring less and less practice. And now – go to the instrument and put everything you have learned into action! I’ll remind you that the learning happens when the fingers start moving, when we put into practice all the new information we have just discovered. One more thing: Piano Intonation is NOT a technique for advanced students. Beginners can and should learn how to play with a singing tone as well, even in practicing easy short pieces – from the very moment they learn what legato is and how it should be played. The sooner you learn how to play flowingly, with a beautiful sound – the better! Now that you learned the basics of Piano Intonation – are you ready to move to the next step? Become a member of my Piano Coaching Program at PianoCareerAcademy.com and get instant access to hundreds of detailed exclusive piano playing tutorials that reveal the technical and expressive secrets of the Russian piano school via my holistic approach to piano playing, music and lifestyle. On the Private Members Forum you’ll also be able to ask me ANY piano question, anytime, and receive personalized, detailed, professional piano advice! And now – a little advice: Never forget WHY you practice! Is it because you want to increase your finger agility? No, it’s not! Is it because you need to improve your key attack and the quality of your tone? Wrong again! Is it because your teacher told you so? I certainly hope not! Is it because you want to be able to play expressively and convincingly beautiful piano pieces? Now we’re getting closer! Many new articles and video tutorials are coming soon on PianoCareer.com (including a series of practice guides for beginners). Follow me on Facebook, Twitter or Google + (and now also on Pinterest!) to get instant updates, support and motivation! I just got my new Korg SP-250 digital piano and thought of your great advice. The journey continues! It sort of goes against a lot that I have been taught but it all makes perfect sense and you make playing the piano sound so simple. Your technique really makes way for your expression to shine through. You can tell that you are really in love with your instrument when you play. I find your tips very useful and I really love watching how your wrists and hands move over the keyboard. I am a piano beginner who love classical pieces. Thank you for the complimentary copy of Piano Phrasing! well know artists such as Gyorgy Sandor, Joseph Hoffman, Tobias Matthay, Abby White, Ruth Slenczynska, and so on. stopped loving the piano. I am restarting again with quite a bit of impediments i.e., including memory and rhythm. If these two could be improved greatly, then… it is worth to continue the dream of playing the piano again. Beethoven. Not to found of Mozart though. Sorry Mozart lovers!! Rhythm and memory are the two issues that concern me the most, now. Thank you once again for the free copy of Piano Phrasing. You will be surprised to discover that once you learn how to play and practice correctly (in a relaxed and mindful manner, by using the weight of your entire arms, by learning how to analyze a piece properly), your memory and your rhythm will improve as a natural consequence! By the way, I recommend reading this tutorial: Understanding a Piano Piece: 11 Basic Steps. You can also find detailed tutorials about memorization and rhythm (and hundreds of other videos and articles on various piano topics) on my Piano Coaching Program at PianoCareerAcademy.com. Thank you again for your comment and enjoy the report! I have recently discovered you on YouTube and have just watched your tutorial on the Intoning technique. I am a self-taught pianist and have been playing the piano for most of my adult life. I must say that found your video to be really helpful and I believe that this technique makes perfect sense and will definately make a big difference to my playing. You have gained one additional fan in Germany! Have a great weekend and enjoy your practice! i enjoy your pearls of wisdom . its one thing to observe your technique ,its another process to apply it yourself and gain the understanding as you practice on the paino. I’m considering joining your Academy. There is much that is useful here. The intonation technique has already helped me with Cole Porter’s “Night and Day”. But that brings me to one of my concerns: I don’t play the pieces you use. The composers I want to play include Cole Porter, Turner Layton, James P. Johnson, Herman Hupfeld, Louiguy, Oliver Wallace, Irving Berlin, Kurt Weil, Harry Warren, Ted Snyder, David Rose, and many more. Will it all be as useful, or will I be lost since I’m not playing pieces you use? My other concern is that this is just way too good. You may soon be overwhelmed with thousands of students, and not be able to respond to them all. Of course, jazz is different – but even professional jazz players visit our Academy for learning useful classical secrets :D.
Plus, I don’t have a rule about ‘pieces I use’. I usually use those pieces that my students are playing – they ask a question about a certain piece, and then I answer it :). Of course, I’m not an expert in jazz, so I could not record tutorials about advanced jazz pieces – but in rest, everything is within reach ;). I certainly wish there would be more than 24 hours in a day, so I could answer in detail ALL the questions that I receive (on our Academy, via email or here on PianoCareer.com) – this would be a dream come true! I have watched and enjoyed watching your video to learn about piano playing. Thank you and hope you can make more videos for teaching piano technique and meaning of symbols of piano. Thank you very much for these fantastic videos, they really help my piano technic. I have a question, why the Piano intonation is NOT a technique for advanced students? Since English is not my mother language, I think I didn’t express my thought correctly (and this is why you misunderstood it a little :D): I meant that Piano Intonation is not ONLY for advanced students – and that it can be learned, in a gradual step-by-step manner, from the very beginning of our piano quest (as soon as we incorporate legato in our playing, which in the Russian piano school happens after 2-3 months of regular practice). For more information, check out my multi-episode Video Practice Guide for Beginners based on Nikolaev’s Russian School of Piano Playing (which can be found on PianoCareerAcademy.com). Thank you for the time and effort you’ve put into this valuable resource – some of it free to everybody. I’m finding your advice on intonation very useful (currently working on Chopin’s 1st Ballade and the Barcarolle). What you suggest seems to make eminent pragmatic and human sense when playing more than one note… however, based on what I’ve read on several forums recently, from a mechanical viewpoint when playing one single note, all that can really make a tonal difference is the velocity and acceleration of the hammer. Weight therefore has no bearing on a single note’s tone. Maybe it’s a moot point since we’re rarely concerned with playing just one note, but I wondered if this academic point is recognised by the Russian School? The piano sound is a form of energy (you can obviously agree or not with my opinion). Its quality, color and intensity are born in our mind, in our imagination. The clearer we can imagine it, the more expressive our rendition will be (even if we play one single note!). This mind-body-instrument connection makes all the difference (being one of the main distinguishing traits of great pianists), but it cannot be fully explained by ‘materialistic’ theories :). Again, volumes need to be written on this topic LOL. More information in my free tutorial The Piano Posture and The Energy of the Sound. Once we understand that everything begins with a clear understanding of WHAT we want to express and HOW it should sound, it will be much easier to find the technical means that will allow us to bring our vision to audible reality. If you read Heirich Neuhaus’s Art of Piano Technique, you will find out that there are three physical elements that influence the dynamic intensity of the sound (may it be 1 or 1000 notes): mass, speed and height. Well, when we apply weight to the key, we literally add more mass, therefore making the hammer strike the string in a different manner, producing a more powerful sound, but without wasting unnecessary energy (which happens when we try to apply the same mass by using the effort of our fingers alone). Also, I can always hear the difference of sound color (not necessarily intensity) if I play a certain note mf but with weight (as compared to mf but without weight). Moreover, a key can be touched in so many different ways (basically, we speak about the speed and height of our attack)! The faster we ‘hit’ a key, the harsher the sound will be. If the speed is slower (if we press the key gradually), the sound will be nobler, rounder, more singing (again, even if we play one single note!). My reply is certainly not exhaustive – just a few ideas to consider :P. You can learn more by watching/reading the hundreds of tutorials that you can find in the Members Area of my Piano Coaching Program at PianoCareerAcademy.com :). Many thanks Ilinca – I appreciate the depth of your response. I think I can hear the difference sometimes when playing with weight, and whilst it doesn’t quite tally with the physics (mass shouldn’t really affect it), I like your mental imagery point. And if that helps us create a better sound, then it’s time for single note physics to take a back seat! Thank you for the wonderful tutorials. I have a question about wrist navigation. I have introduced it more into my playing and find it beneficial. However, I feel it is very comfortable when I am ascending the keyboard but it feels a bit strange to me to lead with the wrist when I am playing a descending passage. Also do you mainly use this wrist navigation technique where there is a large gap between notes? Or could you use it ascending/descending a scale-like passage? You will find very detailed answers to your question in the video tutorials available for the members of my Piano Coaching Program at PianoCareerAcademy.com. The Basic Piano Key Attack. Mastering Whole-Arm Action in 5 Easy Steps. Correct and Incorrect Wrist Action: Avoiding Deliberate Upward Wrist Movements. Wrist Height vs Wrist Action: Achieving Fluidity and Freedom by Using Wrist Flexibility. The Layout of the Musical Text in Piano Playing and the Wrist Navigation Technique. And, of course, as a member of our program you can also learn how to play piano correctly, in an enjoyable progressive manner, developing all your technical/expressive/aural/analytical/practice skills harmoniously (according to the professional system used in the Russian piano school), by following my step-by-step Video Course for Beginners. You can find out more about this Course (and about the functionality of PianoCareerAcademy) by reading our super-detailed FAQs. Excellent article! My question: Is this all relates to a digital piano? Yes, of course – especially if you have a touch-sensitive digital instrument with a weighted mechanism :). Just a quick question from a relative newbie to classical music. Could you tell me the name of the following 5 songs from the above video, and the difficulty level of each (gr 3, 5, 8, etc,)?